We're pleased to announce that Alpha Software will be participating this April in the Spring Midmarket CIO Forum. The event will take place in Savannah, Georgia, at the Westin Savannah Harbor Golf Resort & Spa from April 8 - 10, 2018. 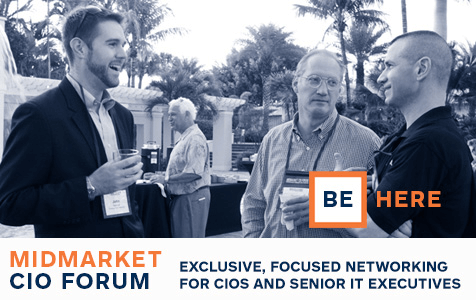 The Spring Midmarket CIO Forum is an engaging, informative, and social venue for IT Executives and Solution Providers focused on technologies for the midmarket. The Forum is an invitation-only conference that covers the cost of hotel, flights and meals for qualified participants. The tremendous insight about the interests of the participants allows a customized experience, ensuring that new connections will be relevant and productive. At this year's event, Alpha Software team members will be showcasing some of our latest technology innovations, including its award-winning Alpha Anywhere rapid mobile app development and deployment platform, the platform's new TransForm capability, Alpha Cloud hosting and Alpha Launch app container. If you're attending the MidMarket CIO Forum or are located near Savannah, we'd love to meet with you face to face while we're in town at the event. Simply email sales@alphasoftware.com and you can arrange a face-to-face meeting with an Alpha Software representative that week. We look forward to seeing you in Savannah!